I got this as a healthier option for my husband and children. Not only did they not enjoy the taste as much but every time I got the jar from the cupboard I needed to drain off about a cm in oil that had accumulated there… not too bad if you like cooking in peanut oil but not good if you don’t. Not a bag peanut butter thouth I prefer the popular one (can’t even think of the brand). This one is smooth, a little gluggy in the taste, but tasty and washes down well. I use the Mother Earth Peanut Butter in my smoothies. The taste is great – it blends well and gives my food a great flavour. This mother earth peanut butter tastes really nice. I particularly like the runnier consistency compared to regular peanut butter. It’s great for making healthier snacks. 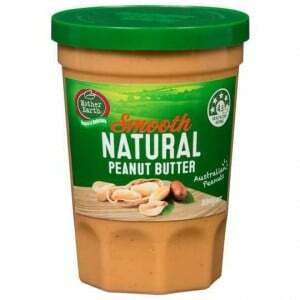 I used to love Kraft peanut butter but wanted to switch to a natural product. I will never buy a different brand again! They also have other varieties with LSA of Chia etc for added health benefits. How would you rate Mother Earth Peanut Butter Smooth?